NICOSIA, Cyprus All banks in Cyprus except the two largest will reopen for business Tuesday - more than a week after they shut down to prevent a run by customers - now that the country has clinched a vital bailout deal. The central bank will impose some limits on financial transactions, the country's president, Nicos Anastasiades said, but assured the public that restrictions would be temporary. The decision that banks would reopen normally at 8:30 a.m. came after an eleventh-hour deal to provide Cyprus with an international bailout was clinched in the early hours of Monday in a Brussels meeting between the 17-nation eurozone's finance ministers. All banks across the country had been shut down since March 16 while politicians set up the plan to secure funding for the bailout, after lawmakers rejected an initial scheme that would have seized up to 10 percent of people's accounts. Politicians from Europe and Cyprus had been up against a tight deadline. The European Central Bank had only agreed to extend emergency funding to the country's ailing banks until Monday unless an agreement was reached. Without a deal, the banks would have collapsed on Tuesday, dragging the country's economy down with them and potentially pushing it out of the 17-nation eurozone. Several hours after the deal was announced, the ECB dropped its threat, saying it "decided not to object" to the Central Bank of Cyprus continuing to provide emergency credit. Cyprus agreed to slash its oversized banking sector and inflict hefty losses on large depositors in troubled banks to secure the $13 billion bailout. Speaking about the marathon 10-hour negotiations in Brussels that resulted in the deal, Anastasiades said that "the hours were difficult, at some moments dramatic. Cyprus found itself a breath away from economic collapse." 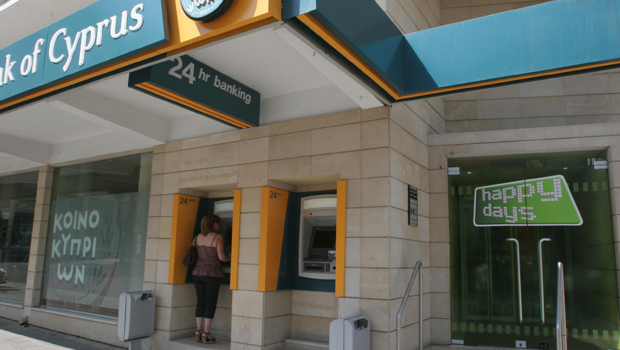 As part of the reopening process, a central bank official said Laiki, which will be restructured, and Bank of Cyprus will remain closed until Thursday, and a withdrawal limit from their ATMs of $130 a day will also remain in place until then. Anastasiades did not specify what limitations would be imposed on transactions in other banks, or for how long. Lawmakers passed a bill on Friday which allows capital controls in times of emergency. "It is a very temporary measure, which will gradually be relaxed," Anastasiades said. Under the new plan agreed in Brussels, the bulk of the funds will be raised by forcing losses on accounts of more than $129,480 in Laiki and Bank of Cyprus, with the remainder coming from tax increases and privatizations. Bond-holders, people and businesses with more than $129,480 in their accounts at Laiki face significant losses. The bank will be dissolved immediately into a bad bank containing its uninsured deposits and toxic assets, with the guaranteed deposits being transferred to the nation's biggest lender, Bank of Cyprus. Deposits at Bank of Cyprus above $129,480 will be frozen until it becomes clear whether or to what extent they will also be forced to take losses. Those funds will eventually be converted into bank shares. It is not yet clear how severe the losses would be to Laiki's large bank deposit holders, but the euro finance ministers noted the restructure expected to yield $5.4 billion overall. Analysts have estimated investors might lose up to 40 percent of their money. The mood in Nicosia was somber. "This decision is painful for the Cypriot people. This decision was a defeat of solidarity, of social cohesion, which are fundamental freedoms, fundamental principles of the European Union," Parliament President Yiannakis Omirou told AP. Ordinary Cypriots were trying to be optimistic. "We believe in our people. People will work hard so we can stand on our feet again," said Nicosia resident Nicos Andreou Theodorou. Jeroen Dijsselbloem, the Dutch minister who chairs the Eurogroup, said the move to inflict losses on depositors should become the bloc's default approach for dealing with ailing lenders. EU officials had said previously that it was a "unique step." His comments caused a sharp drop in bank stocks across Europe, particularly in financially weak countries like Italy and Spain. German Chancellor Angela Merkel insisted that "the result that was found is right." "It also makes those who helped cause these undesirable developments play their part. That is how it should be," she said. Germany has long insisted Cypriot banks, which attracted foreign investors with high interest rates, needed to contribute to the bailout.